LUST Racing lowering kit for Suzuki GSX-S750 2015-2019. Lowers the rear suspension and the seat height on GSX-S750. We offer 1"inch and 1.4" inch lowering kits for the new Suzuki GSX-S750. High quality suspension lowering links made in roll-forged steel stronger than the standard links replaced. Lust Racing suspension links for GSX-S 750 are powder coated for excellent corrosion resistance, color black with LUST Racing logo in silver-chrome and red. The kit is supplied with model specific installation instructions. Lowering the bike will improve rear wheel traction and increase high speed stability. Also the center-of-gravity is lowered. Excellent modification also for shorter riders who otherwise may struggle to reach the ground with both feet. 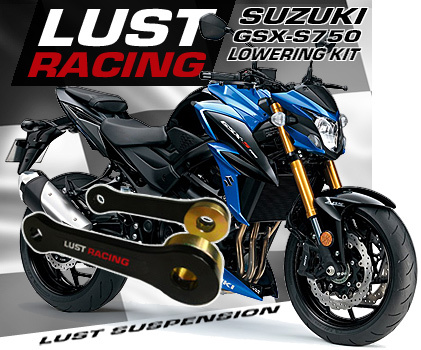 The LUST Racing lowering kits for Suzuki GSX-S750 is a hifgh quality aftermarket accessory designed, engineered and manufactured in Europe by Lust Racing ltd. Select either 1"in or 1.4" inch lowering kit below.